Revolution of the Soul is the name of Seane Corn’s newly completed and soon to be released book that she’s been manifesting for 3 years. The title called to me immediately, suggesting that the soul is not immutable but is capable of deep transformation. It also reminds me of my favorite Beatles album – Rubber Soul – bringing to mind the idea that the soul is resilient but capable of change. Seane offered two pop-up classes this week in cities that were key to her own transformation – New York and LA – to show her gratitude to her students for their role in helping her birth the new book. For those of you familiar with Seane’s work, you know she is deeply dedicated to taking yoga “off the mat” and the new book is a culmination of her life work to change the world through yoga. It’s been a long time since I’ve practiced with Seane. This pop-up came at the perfect moment for me; I’ve been feeling stagnant in my yoga practice. So when I saw the email from Seane’s website announcing the class in Yogaworks Soho, I decided it was worth the schlep into the city in the middle of winter. I was expecting a mat-to-mat yoga experience with perhaps a lot of deep discussion before and after the physical practice. The mat-to-mat part was true – the class quickly sold out – but the discussion was magically interwoven into the physical practice. Seane offered up her philosophy of soul transformation as part of her cuing throughout the strong vinyasa flow. She started the class by introducing a newly found friend, Ian Manuel, who was incarcerated at the age of 13 for a life sentence without parole, a sentence spent mostly in isolation. Ian was recently released on appeal after 26 years and used the isolation experience to move within, find Buddhism, and discover his gift for poetry. He kept in touch with his victim and asked for and received her forgiveness – she was instrumental in helping him attain his release. Ian performed his poetry during the quiet moments of the flow. Early on, he offered up his poem about prayer through the body and towards the end, his poetry spoke about transformation through the breath. Seane’s cuing continually brought us back to the theme of experiencing prayer and transformation through physical self-exploration. Alignment cues were minimal except for some subtle cues to ground properly through the feet and foundation to release freedom in other parts of the body and to breath in sync with each movement (a lot of lion’s breath interspersed throughout). During the early rounds of sun salutations, we were asked to offer up each round as a prayer to someone – first to someone we deeply loved, then to someone who was having difficulty in their life, and finally to someone who’s brought difficulty into our lives, ending with a call to release our resentment of those who have brought us pain and offer forgiveness in the realization that they too are working through their own pain. She also offered up a prayer to the leaders of our nation and our world that they may find wisdom in their leadership. The flow was fundamental, with deep long holds, to allow us to explore and release our discomfort in each hold. It was intended as a physical and spiritual detox. After the sun salutations, we worked on opening the shoulders and upper body in standing poses with gomukhasana (cow-faced) arms, arms clasped straight behind the body, twisting lunges and revolved triangles. We opened the hips with Warrior 2, triangle, prasarita padottonasana (wide legged forward folds) and skandasana (side lunges) before we moved into opening the heart with several camels and bridges or wheel poses. The final grounding poses included badhakonasana (cobbler’s or butterfly pose) double pigeon and seated forward fold. As with most detox classes, there were no inversions other than down dog and standing forward folds. We ended with a meditation to find love and forgiveness in ourselves so that we may find a way in our individual lives to heal the divisiveness in the world, to release hate and fear and break the chain of emotional violence toward each other. Throughout the class, I found myself linking easily to my breath. With Seane’s prayers and soulful exhortations in the background, I was able to ignore the sweat and the hot bodies around me (the reason I avoid hot yoga and crowded classes) to find more ease in each long hold, giving in to gravity and releasing discomfort and resentment. Savasana was deeply satisfying and my body felt calm and literally all wrung out – a perfect kick-start to end the recent stagnation in my practice! Seane’s book is due out in early September. So sign up for her newsletter on her website and keep an eye out for a special release event in NYC. Get the book and get ready to transform! May Louie first took yoga in college to fulfill a Phys-Ed requirement and immediately fell in love. 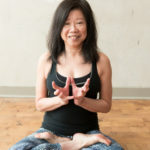 She, unfortunately, did not continue with her practice but reconnected with it when she retired from her corporate job in 2002 and has since become a serious yoga enthusiast. After her second retirement last year, she completed her 200-hour RYT certification, studying with Dina Crosta, Ellen Mosko, and Jamie Segal Hanley, with a focus on alignment based flow.